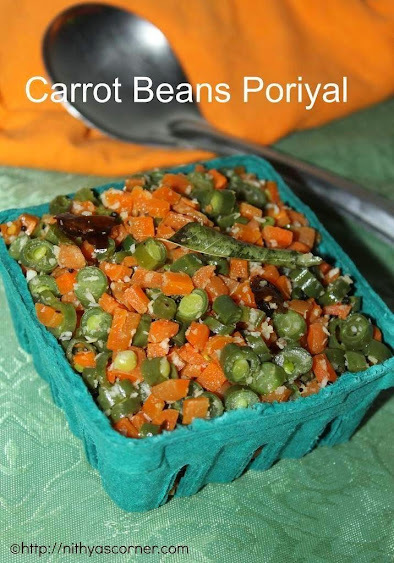 Carrot Beans Poriyal is one of my favorite side dishes. During my childhood days, I hated this side dish so much. My mom used to run behind me all the time asking me to have this. After my marriage, my mother-in-law makes this side dish often at least once a week. 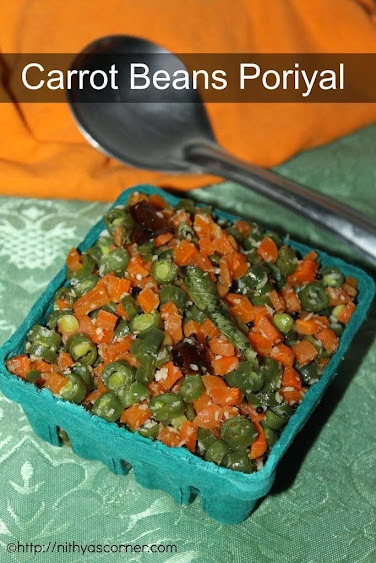 Once you cut the beans and carrots, then you are all set to make this recipe. I promise it is very easy to make. You can even cut the veggies the day before you are planning to make this dish and then make the dish the next day. This way you can save a lot of time. Whenever I buy beans, this is one of the recipes I make at home. Sanvi likes carrots but not beans. I cut carrots in bulk and then make this dish for us. 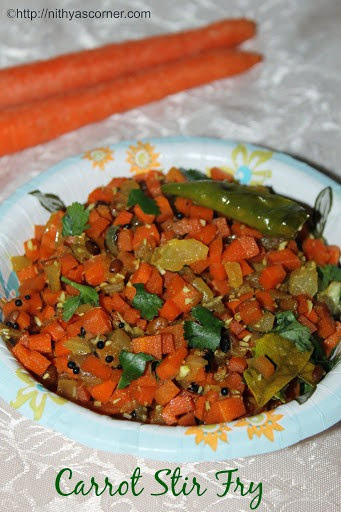 For Sanvi, I will make Carrot Poriyal / Carrot Stir Fry. Even when I have guest at home, I will make this side dish as it goes along with curd rice, sambar, rasam etc. Adding coconut is optional, but coconut definitely add a nice flavor to it. Make sure you turn off the flame and then add the grated coconut. Carrots – 2 big nos. Beans – 15 to 20 nos. 1. Peel the carrot’s skin and chop the carrot and beans as per your preference. In a frying pan, heat 2 teaspoons of oil.Then add mustard seeds (kadugu), urad dal, and red chillies. 2. 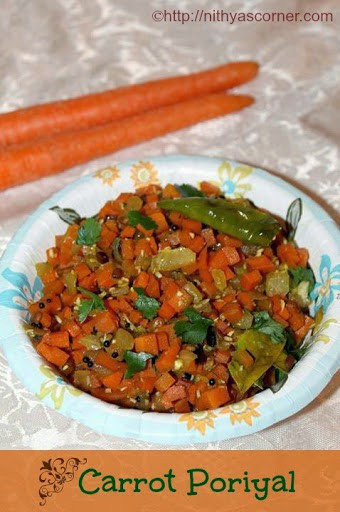 When mustard seeds splutter and urad dal turn light golden brown, add the chopped carrots, beans, curry leaves, salt followed by asafoetida (perungayam). 3. Cook for 3 to 4 minutes. Sprinkle water and close the pan using a lid. Cook for 4 more minutes. 4. Once the carrot and beans turn soft (veggies should neither be overcooked nor undercooked), switch off the flame, and finally add grated coconut. Stir well. Now, Beans and Carrot Poriyal is ready! This entry was posted in With Coconut and tagged Carrot on November 22, 2014 by vikashbhardwaz. 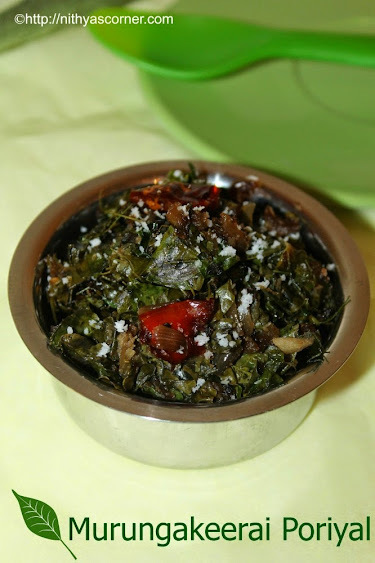 Usually, I add gram dal while making Cabbage Poriyal, but in this recipe I have used roasted gram dal. 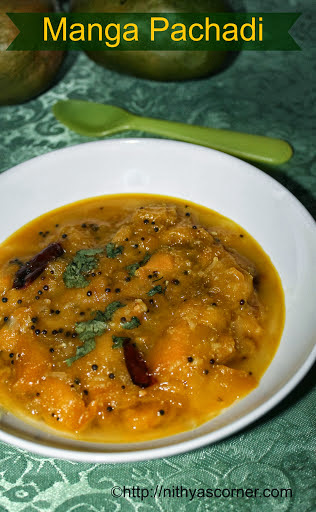 Roasted gram dal will be easier to eat and chew when compared to the gram dal. I like both the versions. I have this dish usually with Sambar, Rasam and Curd Rice. Cabbage is very good for diabetics. My husband loves cabbage and asks me to make cabbage recipes at least twice a week. I try the cabbage recipes with brussel sprouts also. I cut the brussel sprouts similarly like cabbage and follow the same procedure. In my childhood days, when my mom makes Cabbage recipes, I’ll be the first person to silently frown seeing the dish. During initial days of my marriage, I will make Cabbage Koftha, Dry Spiced Cabbage and Cabbage Koftha Curry often. Even when I have guests at home, that will be the first dish that I prepare. Nowadays, I have started liking it mainly because of its health benefits. 1. Heat oil in a frying pan. Add mustard seeds and let it splutter. Then add the urad dal and fry till it turns light brown. Now add red chillies followed by chopped onion and roasted gram dal (pottukadalai). Fry until onions turn transparent. Then add finely shredded cabbage. 2. Stir well and close the pan using a lid and cook for 10 minutes or until the cabbage gets cooked. Do not add water as cabbage itself will leave water. Cook until the cabbage becomes little dry. Add grated coconut and turmeric powder. Stir well and cook for 5 more minutes. Add salt. Stir well once and finally sprinkle coriander leaves. Now, Cabbage Stir-Fry is ready! Serve. With Rice, Kootu, Sambar and Rasam. 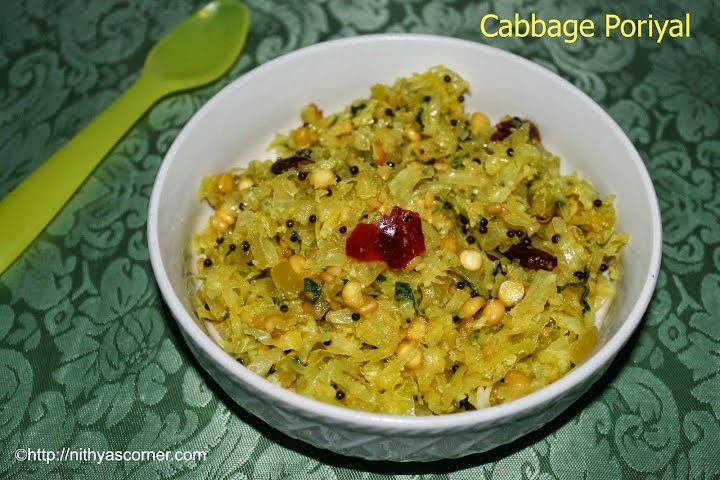 This entry was posted in With Coconut and tagged cabbage recipes, curd rice, roasted gram dal, Spiced Cabbage on November 22, 2014 by vikashbhardwaz. Kovakkai Fry is very crispy and goes well with curd rice, rasam and sambar rice. It tastes very well. 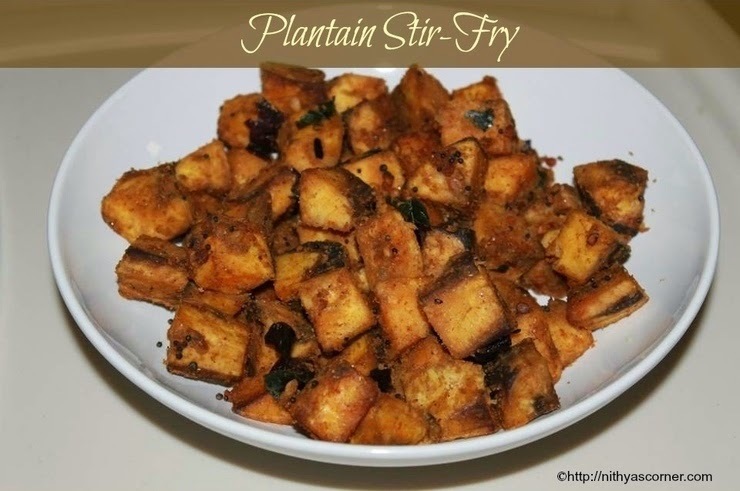 You can make this Kovakkai Fry in a jiffy. Your family will definitely like it. I make it when I have guest at home. My husband’s friend, whenever he visits us from Detroit, will request me to make this fry. He will eat it with curd rice. Though I make Kovakkai Urulai Poriyal quite often, this is one of my favorite side dishes for rasam, sambar and curd rice. Chopped onions – 2 nos. 1. In a pan, heat oil and add mustard seeds (kadugu) and red chillies (kanja molaga). When mustard seeds splutter, add chopped onions followed by curry leaves (karuvepillai). When onions turn light brown, add chopped round kovakkai pieces and salt. Fry for three to four minutes. 2. Then add chilli powder (milaga thool), and fry for two more minutes. Now, add rice flour little by little and stir well. Fry for 3 more minutes. Do not add water as it will make the fry mushy. At one stage, kovakkai will become crispy. Close the pan and cook for two more minutes. Do not overcook kovakkai. It should be little crunchy. Finally, add coriander leaves. Now, Kovakkai Fry/Tindora Fry is ready! Choose green kovakkai. Avoid ripe kovakkai. This entry was posted in With Coconut and tagged Chilli powder, curd rice, Fry, Kovakkai Fry on November 22, 2014 by vikashbhardwaz. 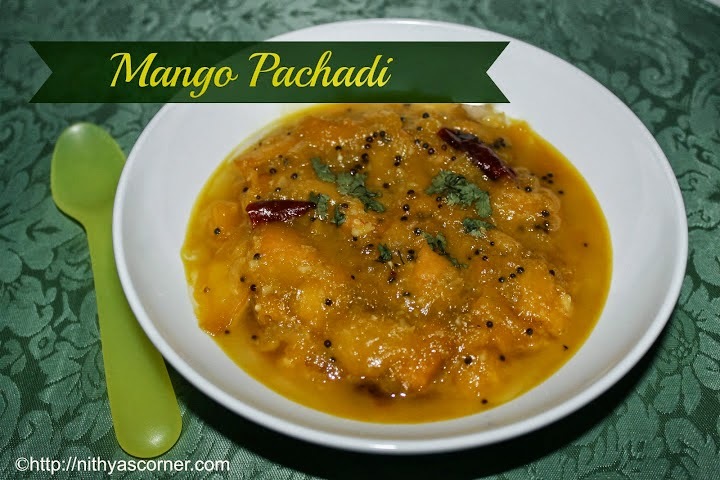 When I buy Mangoes, the first thing I would do is to make this Mango Pachadi. My hubby loves it too. Sometimes, I make using jaggery, and if I do not have jaggery at home, I make using sugar. Yes, while making this recipe I did not have jaggery so I made using sugar.The pachadi with jaggery will be little dark in color. I will post the jaggery version soon. I still have one mango left in the refrigerator. I eat this with Sambar, Rasam, Mor Kuzhambu and sometimes even with Curd Rice. I usually like to eat it with sambar. During the season of mangoes, I prefer to eat this dish rather than drinking mango juice. 1. Heat oil in a pan. Add the mustard seeds and let it splutter. Then add red chillies, chopped onion and grated ginger. Fry onions till it turns light brown. 2. Then add mango pieces. Cook the mango pieces until tender, and then add 1/2 cup of sugar and little water. Boil well. Now add grated coconut and boil for two minutes. 3. Then add chilli powder and turmeric powder. Boil till the raw smell goes off. Then mash it well with a ladle. Boil for two more minutes. Now, Manga Pachadi is ready! Serve as an accompaniment to rice. This entry was posted in With Coconut and tagged curd rice, jaggery, Manga Pachadi, Mango Pachadi, Mor Kuzhambu on November 22, 2014 by vikashbhardwaz. In my school days, my mom used to run behind me and make me eat greens. When it comes to any Murunga keerai (drumstick) dish, I will run behind my mom asking for more. 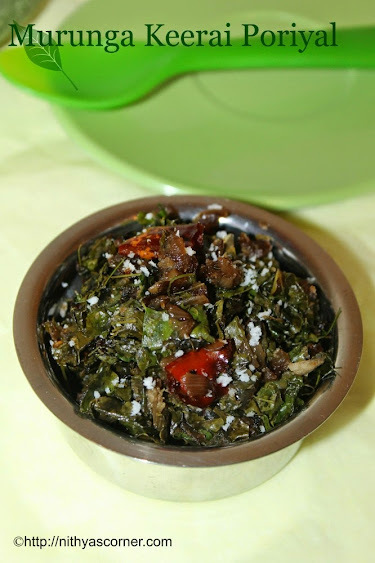 Right from my school days, I love Murunga keerai so much. My father also likes it so much. When it come to Murunga keerai poriyal, I love it so much and usually I have it with sambar or curd rice. I can even have about 3 cups of Murunga keerai poriyal. I do not get Murunga keerai here so whenever I go to India, my mom makes this murunga keerai poriyal and murunga keerai sambar for me. I also love its color – the dark green. Adding grated coconut is one’s choice but I like it with grated coconut. I feel the grated coconut give a special flavor. Did I say its Gj’s favorite too. 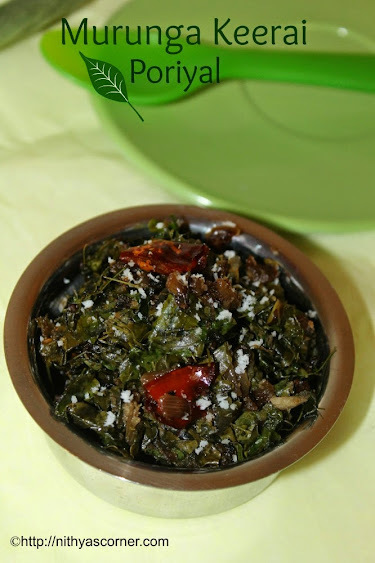 When my mom came from India this time, I asked her to bring some Murunga keerai leaves. I have to quickly cook it otherwise it will spoil very easily. I did not find time to click pictures, but I have done my best. Hope you all like the pictures as well as the recipe. 1. In a pan, heat oil and then add mustard seeds. When mustard seeds splutter, add urad dal, asafoetida, and red chillies. Once urad dal turns golden brown, add the chopped onion. 2. Once the onions turn golden brown, add the murunga keerai (drumstick leaves). Stir well. Do not add water. The keerai will get cooked by its own water. 3. Add salt and stir well. Cover with the lid and simmer the flame. The raw smell of the murunga keerai will go away. Keep stirring for a minute or so. 4. When the keerai shrinks in size, add grated coconut and give a quick stir. Now Murunga Keerai Poriyal is ready! 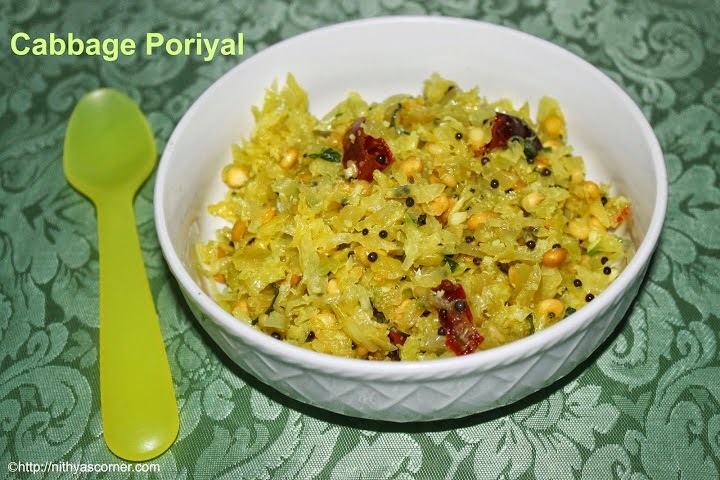 Adding grated coconut is optional but grated coconut enhances the flavor of the poriyal. Murunga keerai gets cooked easily. They also get burned quickly. If it gets burned, they would taste bitter and the poriyal will not taste good at all. To retain the keerai color, you can add 1/2 teaspoon of sugar. Use only the leaves and remove the stalks. This entry was posted in With Coconut and tagged grated coconut, Murunga keerai poriyal on November 22, 2014 by vikashbhardwaz.